The labor cost advantage enjoyed by some Southeast Asian economies over China goes beyond factory jobs, according to a new study by Willis Towers Watson. Average base professional salaries in China are 1.9 to 2.2 times those of Vietnam and the Philippines, the study said. Entry-level white-collar professionals in China receive an average annual base salary of about $21,000, or 30 percent more than their counterparts in Indonesia, according to WTW’s “2015/2016 Global 50 Remuneration Planning Report”. The report covers the professional level and middle, senior and top management. 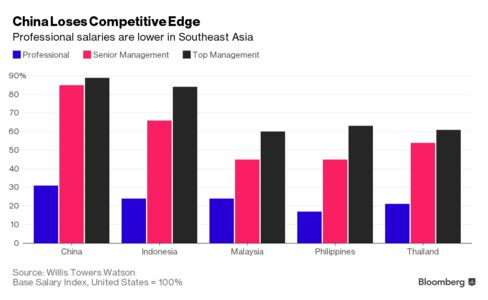 It shows that, across the board, China base salaries are about five to 44 percent higher than Indonesia, the most expensive labor market in the emerging ASEAN economies. “If companies are looking at labor costs they see that China wages are getting higher,” said Rakyan. “If they were to move their plant from China to Indonesia or Malaysia, they would be able to save on labor costs. That’s just one factor among a lot of other factors that affect moving operations, such as infrastructure and the availability of labor. However, China still enjoys some advantages that mean it remains attractive to some employers, he said. The competitive advantage enjoyed by the low-cost economies may be short-lived. “Wages have gone up in China, it will happen in Vietnam in another 10 years, and then it may be Myanmar after that,” said Rakyan. PreviousIs China’s Authoritarianism Decaying Into Personalised Rule?